Selling is hard. You’re trying to convince people to give you their hard-earned money for your product. Plus, you’re competing against every other company out there trying to get their money, too! And when you have a startup? It’s even harder. You’re trying to convince people to give you money… and your product is likely not very good yet. Or it’s not built at all yet (and you’re just selling hopes and dreams). Recently, we launched SendFox — a new SaaS product from Sumo Group. There are lots of startup people out there who give “advice” on how to create a business, or how to do sales. The problem is, they’re delusional or they’re lying. They’re sharing advice based from their company that has been around for years and already has momentum. Or, they’re sharing theoretical tips that don’t really work — maybe they’ve never actually done sales before, and they don’t know what they’re talking about. Today, I’m sharing ACTUAL advice we used to grow a brand-new startup from day one. You’ll see we grew SendFox from $0 to $27,480 ARR in four months. Chart of our MRR at SendFox. Multiply by 12 and you get our approx. ARR. At SendFox, we don’t have a huge team — we have one developer, one designer, and myself as the General Manager. And we don’t have an ads or marketing budget right now. Everything we do is boots-on-the-ground, guerrilla marketing. When you’re an early-stage company or brand-new startup, don’t expect much glamour. There are long hours. Lots of rejections. Desperation. The Instagram highlight reels of famous entrepreneurs flying around on private jets don’t show you how most entrepreneurs start out out with the boring stuff — customer support, writing down bugs, and hustling. But there are shortcuts to make growth easier. And I’m going to share a few. I’m always surprised by entrepreneurs who don’t use their own product. If you’re not using your own stuff, why should anyone else? For SendFox, we leverage the footer of KingSumo, one of our smaller sister sites. And the footer of Noah Kagan’s email list of ~80,000 subscribers. This small logo at the bottom of our sister website footer and Noah’s emails drive about 5-40 people applying for SendFox access per day. (On a normal day, we saw five applicants. On days we sent a large email to Noah’s list — once every couple weeks — we saw 40 applicants). We convert roughly 10% of these applicants into paying customers. Footer on our sister KingSumo website. Notice the “SendFox” link. Footer at the bottom of all SendFox emails, which linked to our homepage for prospects to easily apply. The SendFox homepage after a prospect clicked a footer logo. We converted 10% of users who applied. 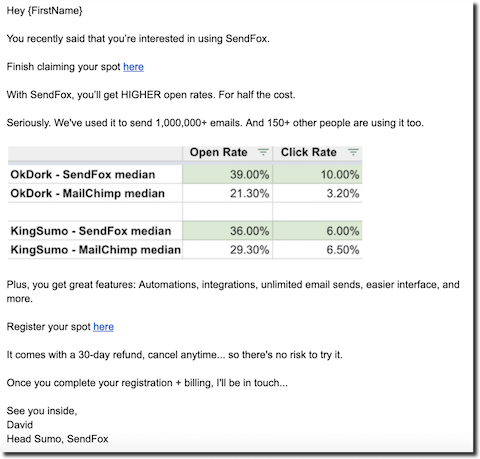 As we get more SendFox customers, the email footer has an exponential effect on the number of signups. Everyone who pays to use SendFox had a SendFox logo at the bottom of their emails. As more people sign up, the multiplying effect continues — more people use SendFox, more people send emails using SendFox, more prospects see the SendFox logo at the bottom of emails they receive… and then apply to use SendFox themselves. We’re able to get away with an email footer logo on our paid plan because SendFox is the affordable, easy-to-use email tool. It costs 50-70% less than other tools like Mailchimp, ConvertKit, and Drip. Users are willing to trade a small ad at the bottom of their emails because they’re saving hundreds to thousands of dollars per year for a better tool. Of the 213 customers we have, roughly 1% lightly complain about wanting to remove or hide the footer logo. But, no user left SendFox because of the footer. We grow customers 33%+ every month without spending a dime on marketing mostly because of the footers. When a user applies to join SendFox, we put them in a sales funnel. At first, the “sales funnel” was me manually emailing via Gmail. Copy-and-pasting email addresses into Gmail one-by-one, and emailing them copy-and-pasted scripts from a Google Doc. For the early prospects, I would invite them to book time on my calendar to see the tool and share their email marketing experiences. 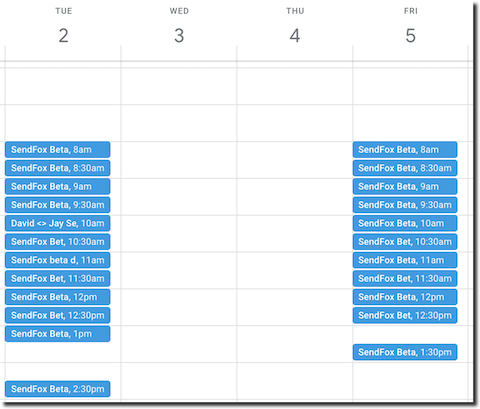 About 60% of users invited to book time did. I think they felt more of a connection face-to-face. It might seem silly to spend 30 minutes on a call to make $10, but to this day our early customers are some of our best. They stick around, and the LTV is worth it. I kept my “demo days” to two days a week (to keep my schedule my organized and increase urgency). Here’s one week of my schedule. When we had a good group of users, I decided to test closing people over email. My philosophy was if I was able to sell at least the same amount as I did when doing phone calls, the time savings of not having to jump on the phone would be worth it. It worked immediately — sales over email matched up to sales over the phone, so I transitioned to 99% over-email selling. To stay on top of people I pitched, I’d note in a spreadsheet when I last emailed them. Then, I would follow up every few days. The metrics of phone calls vs. selling over email, based on a few days of data. Email worked as well — and sometimes better — than phone calls. Plus, I saved a lot of time. A peek at the spreadsheet I used to track applicants. My cadence was following up with people who were interested every ~1 week. I would follow-up 4 times, and if I didn’t hear back I’d mark them as inactive. One of the things I think many entrepreneurs, and wanna-be-entrepreneurs, don’t know is that the early stages of growing a business are laborious and manual. I would typically dedicate the first 1-3 hours of my day responding to emails and pitching people. That’s what I needed to do to start bringing in customers, so I hustled to do it. As time went on, and we started generating revenue, we used a tool called Reply to help automate the sales process. The automated sales outreach campaign worked great. We averaged 10-17 new paying customers per week using a sales outreach campaign. When we tested disabling the campaign to see if people would sign up immediately without any push, we saw a 50-70% drop in signups. Ouch. Follow-ups matter. Day 3 email. Notice how I focused more on benefits. The early emails were much shorter, but with email 3 I wanted to sell the applicant harder, and really showcase the benefits of SendFox. Here’s the link to our full outreach campaign copy that you can use. All our outreach emails had 60%+ open rates, and high response rates. The high open rates happened because we emailed only interested prospects (aka people who had applied for access), and because we had compelling subject lines. Seann and Bar at Sumo recommended to me that every subject line have the prospect’s first name. Using shortcode in the Reply tool, we made sure they did. Because Reply took prospects out of the sales funnel who replied, it was my responsibility to make sure to follow-up with interested prospects. I used a spreadsheet to track when I last talked to a user, and would follow-up every 3-7 days to try and get them to buy (similar to my manual outreach days before I had Reply). Example of a manual email follow-up, after someone replied to a sales sequence. I would email interested prospects who responded every 3-7 days for 4 times. Urgency: We’re not going to have our early bird pricing forever. We have limited spots, and we’re planning to 2-3x the price soon. Affordability: You applied for access to SendFox because you wanted something more affordable. SendFox is 50-70% less expensive than other email tools, and you’ll be locked into this cost for life. Coaching: If you join, I’ll help coach you on how to send better emails and do better email marketing. I’ve run email marketing for two 8-figure businesses, so I can help you grow, too. I would follow-up with each person until I didn’t hear back three times in a row. When I didn’t hear back three times, I would mark them as inactive and stop emailing them. And if they declined, I recorded the reason why and stopped emailing them. Today, we’re working on bringing our automated sales emails from Reply into SendFox. But the process will remain the same. The non-responders are marked in orange, and the deniers are marked in red. Notice the comments I left that I emailed each person three times. Sales for a new startup are tough. Because new tools are feature incomplete, I try to convince a LOT of people to join even if our tool doesn’t have everything they wanted. It’s like being stuck between a rock and a hard place: Prospects want features, and say they won’t join unless you have features… but you need time (and revenue) to build the features they want! To solve the feature requests, we created “catch-all” features that appealed to a variety of users. Like an API connection and a Zapier connection. For example, when people as if we integrated with specific tools (everyone wanted a different tool integration) we said no, but we do have Zapier and API which connected with just about everything… and we would add their request to the backlog. The questions from prospect. Everyone has a question, and everyone wants an integration! Some entrepreneurs hate doing sales. They think sales outreach campaigns are annoying, and that the product should sell itself. In the early days, my philosophy is you need to hit sales hard. I teeter the line of annoying people, sometimes going too far. Every once in a while, we hear from people to leave them alone. But the proof is in the numbers. When we do sales outreach campaigns, our sales increase 50-70% every week. I think heavy sales pushes are valuable to get a business going, and then you can start to back off when the product is more feature-complete and better sells itself. Normal churn for a SaaS company should be between 5-10%. 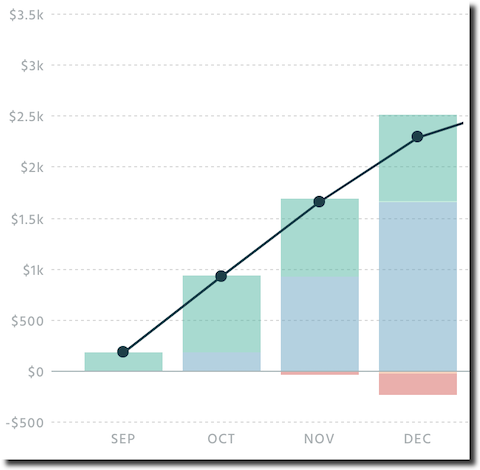 We kept a careful eye on ConvertKit’s public revenue data to measure our churn accordingly. In September, when we did white-glove sales calls and in-person selling at a conference, our churn was low. Four months later, our churn for September remains only one user (5.88% churn for that month). But subsequent months have been much more concerning. 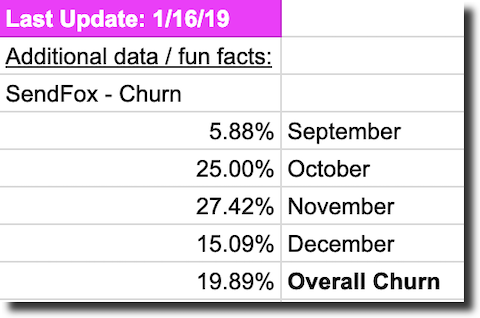 In October, we saw a churn of 25%, in November 27.42%, and in December 15.09%. Ouch. Notice how the churn increased for subsequent months. And notice the high churn in general. Ideally, churn is 5-10%… we’re much higher. In the early days of any tool, a business gets customers to join based on what customers believe the tool will become. Maybe they’re waiting for a feature they were promised would come. Or maybe they’re indirectly hoping for a feature that they never mention. Or maybe they’re convinced by a slick salesperson. In September, we did a great job of connecting and vetting each potential prospect. I would talk to each potential customer on the phone or at a conference for 45 minutes, hear about what they wanted, and help them sign up if it fit their needs. There was a human touch that made the tool feel more personal. Once we moved to selling mostly over email, it became less personal and more like any other tool out there. I think normal churn is higher in the early days of a business. I was trying to balance getting people to sign up and overpromising features. Some of the features I over-promised — thinking they would be ready earlier than they are. Things like custom fields, Shopify integration, and advanced segmentation. We were hoping these features would be released months ago, but with a small development team, things are always shifting. Many users who were promised features that still haven’t come out in the timeframe they were promised have left. There was some desperation in the early days I felt, too. I wanted more signups to help offset our costs as soon as possibly, so I promised features that I knew were aggressive in the timeframe I promised. I don’t feel great about this, and I think a big part is because this was my first software company that I was starting from zero. Drive traffic in places your prospects will see. We used footer logos, but you can use email signatures, “powered by” badges, and more. Use a sales funnel to sell your prospects. When we automated six sales emails, our signups doubled. 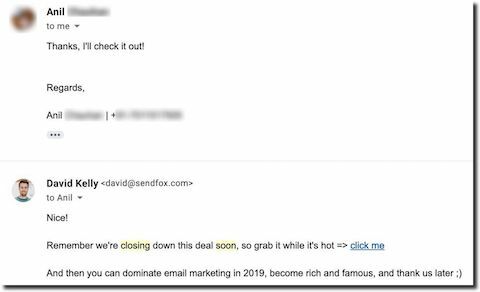 Put together a group of sales emails immediately after a prospect is interested. Most prospects will sign up in the first 48 hours, so hit that timeframe hard. Expect churn to be higher in the earlier days. Our churn is about 2-3x where it should be. Part of it this is adjusting our target market. Part of it is also the life of a new tool, so keep priming your pipeline with leads to offset the churn. What else did you learn in this blog post? Leave a comment below — I read every one.